Trip inspiration comes from all directions. While more Americans traveled for leisure in 2017 compared to the previous year, understanding what motivated these trips and how they took shape can be tricky. In addition to deciding where to go, travelers are faced with figuring out how much to spend, whom to travel with and how to get there. It's a no-brainer that travelers value the ease of getting to a destination. 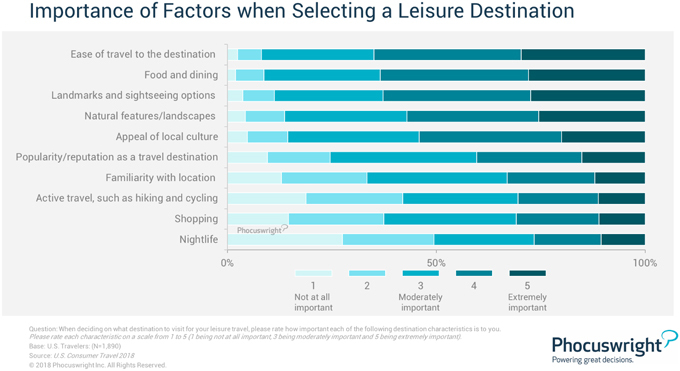 But our latest survey also found food and dining as an extremely important factor when choosing a destination. A significant amount of these travelers, 30%, started their research for their trips on a mobile device. Many travelers opted to keep it simple in 2017. In fact, six in 10 visited a destination they had been to before. Plus, more travelers drove to their destinations, with an influx of lower-spend travelers shrinking the share of travelers venturing abroad. Younger travelers tended to book closer to their date of travel compared to other age groups; 28% of travelers 18-34 years old booked their last leisure trip within two weeks of travel, compared to just 15% of travelers 55+. But youth doesn't equate to impulsiveness. Younger travelers spent more time researching where to go (roughly by a week longer than the 55+ category). As part of the U.S. Consumer Travel 2018 series, this travel research report focuses on what inspires consumers to travel, how they decide on their destination, and the tools and information sources they rely on for inspiration and while planning their trips. Copyright 2018 Northstar Travel Media LLC. All rights reserved. From https://www.phocuswright.com. Analyst: Phocuswright Research.